Singing with The St Giles Cathedral Choir for BBC Radio 4 at 8am morning service. DIGITAL release of The Sea Inside of Me (all digital platforms such as spotify, itunes etc). Preview of ‘Nancy’s Song’ written for soprano, tenor and piano. Phamie will be singing with The St Giles Cathedral Choir for both Christmas morning services (10am and 11.30am). Choral Classics Fringe Concert at 20h. Edinburgh Album launch of Beyond the Milky Way cd and book. Guest appearance at a Burns Supper event. Scottish Arts Club. 31st December – Singing in St Giles Cathedral Choir. Hogmanay Concert (sold out). Handel (Dixit Dominus) and Bach (Missa Brevis in F Major). May 31st- June 11th – performing as ‘guest entertainer’ on a Cruise to Iceland (Rejyjavik, Haelavikurbjarg and Hornbjarg, Akureyri, Grimsey, Skyalfandi Bay, Cape Enniberg, Klaksvik – Faroe Islands). December 2nd – Phamie Gow Guesting at The Queens Hall. Edinburgh. Scotland. Concert to raise money to help support Nordoff Robbins Music Therapy Charity. Click on a year heading to drop down all the events that took place in that year. 5th-11th January in NYC for APAPPhamie will be making a guest appearance at the Heavenly Rest church service on 90th st and 5th avenue on Sunday 8th. Service starts at 10.30am. She will also be singing in the choir in the same service. Thursday the 19th is the opening night (SOLD OUT) of The Infamous Brothers Davenport at The Royal Lyceum that Phamie is casted in, and is also Musical Director and composer. 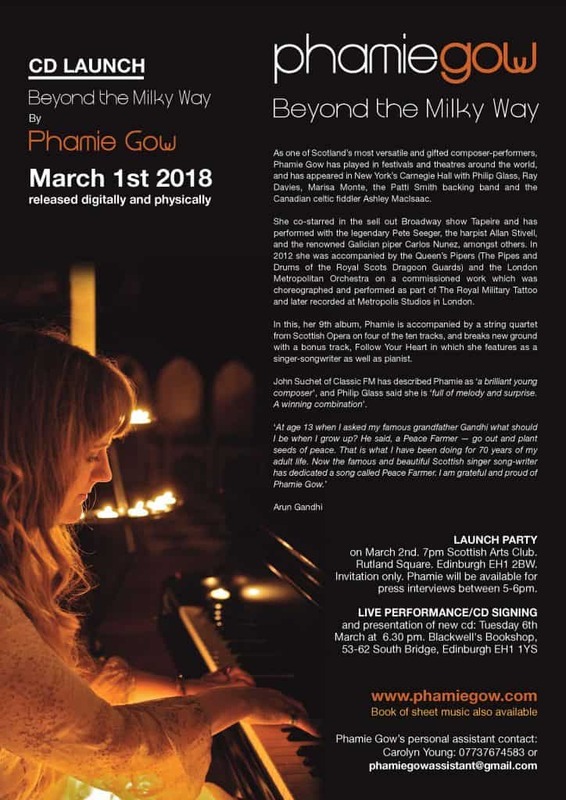 Royal Lyceum previews: 19th and 21st Jan.
From the 3rd – 28th of August Phamie’s composition ‘The Water of Life – Uisge Beatha’ taken from her new cd The Angels’ Share will be performed every night at Edinburgh Castle for The Royal Military Tattoo. 26th of June – The Bedford. London. 1st of July – Performing at the opening of the Scottish Parliament, Edinburgh, Scotland. 5th of December – rehearsals/writing for ‘The Infamous Brothers Davenport’. Royal Lyceum. Edinburgh. UK. February 6th – Masterclass and concert – BREST, France. February 8th – Concert in Arboras, France. 13th March – A Cry Out for Chile – Scotland. October – 11th – 13th- Recording ‘Road of the Loving Heart’ album in France. October – 14th – 18th – Performance in Paraguay. Latin America. October – 20th – 24th – tour of Phamie Gow Band in China. JANUARY 10th- Phamie Gow live in Concert. Monteperoux. FRANCE. JANUARY 15th – Premier of Celtic Connections performance with Ashley MacIsaac. Glasgow. SCOTLAND. 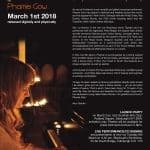 MARCH 6th – Phamie Gow in Concert, Sintra. PORTUGAL. MARCH 14th – 31st, Buenos Aires. ARGENTINA. MARCH 21 st – Centro Cultural de Borges Buenos Aires, Argentina. ‘La Vida Buena’ show. 20.30pm. Phamie Gow show with music and dance. APRIL – 20th – 24th – Recording with Kepa Junkera in El Pays Vasco, SPAIN. JUNE – 6th Solo concert in Palmela, PORTUGAL. JUNE 19th – International Festival of Harp – Barcelona. SPAIN. JULY 9th – 12th – CELTICA Music festival.Valley D’ Aosta. ITALY. Mon 24th. 2pm – 3.15pm. ‘The Root of All Evil?’ with Mon 24th Aug with Vincent Cable MP. OCTOBER -3rd – Phamie Gow solo in concert. Cascais. PORTUGAL. 20th – 24th: Phamie Gow International Quartet representing Scotland. Nanning, CHINA. 13th February. The Tibet Concert, Carnegie Hall, NEW YORK CITY. Musically directed by Philip Glass and performances with Band of Horses, Ray Davies, Nawang Khechog, Ashley MacIssac, Marisa Monte, Sufjan Stevens & Tom Verlaine. 11th – Radio Interview for Radio Languedoc. FRANCE. 17th March – St Patricks Night. Special guesting with Brian Bolger at La Antirouille. Montpellier. FRANCE. 2nd April – Radio interview/performing ‘live’ for Radio Languedoc. Montpellier. FRANCE. 5th April – ”Modern celtic harp masterclass and concert”. Montpellier, FRANCE. 5th – 8th May- MALLORCA. Phamie Gow in Concert. 28th – 30th May – IBIZA. Phamie Gow in Concert. 16th August – Edinburgh Festival. Phamie Gow in Concert. St Johns Church, Princess Street. 28th/29th/30th August – Tondor Festival. DENMARK. 7th September – Recording studio session with Soriba Kouyaté and The Black and White Experience. VALFLAUNES, near ST MATTHIEU DE TREVIERS. FRANCE. PHAMIE GOW (harp, voice, accordion, flute, piano). 27th – Release of ‘Smooth Classics – The Ultimate Collection’ UNIVERSAL/Classic FM. UK. 29th November – Harp Master class. Montpellier. FRANCE. 4th December – Boit de la musique. Montpellier. FRANCE. Presentation. 25th of January: Recording with LANTZ (www.hirustarecords.com) in the ESTUDIO HIRUSTA in HONDARRIBIA (GIPUZKOA) near Sant Sebastian, Spain. March: March the 9th. A meeting of poetry and music with Alison Boston (www.alisonboston.com). Caj Chai, Sant Domenec del call.12. Barcelona. SPAIN. From 22.00. March 25th – Performance in a celtic music festival in Valencia. SPAIN. 15th April. El auditorium del belgrano. Argentina. 17th April: La Manufactura Paplera. San Telma, Calle Bolivar, 1582. Argentina. May 2nd: International harp festival. (Musica no museo) Rio de Janiero.BRASIL. 21st June: Event for EXPO 2008, Zaragoza, Spain. Main auditorium, and for National Spanish TV, and Spanish Royalty. 12th-14th July: Performance in the show James Devine`s Tapeire in The Junction Festival. IRELAND. 10th – Launch of Moments of Time in coda music shop, on the mound in Edinburgh. Scotland. 14th – Promo performance at the Counting House, Edinburgh. Scotland. (from 10pm onwards). 26th August: Phamie Gow in concert. Festival of Spirituality (member of the Edinburgh Festival group). EDINBURGH. St Johns Princess Street. SCOTLAND. Buy tickets from St Johns book shop, off Princess Street. Edinburgh. December 2nd till 7th – Tapeire in LONG ISLAND. New York City. December 30th – The Night Afore gig guesting with Ashley MacIsaac. George Street. EDINBURGH. ´A virtuoso who can tickle and glide across the strings just as majestically as Harpo Marx once did, her enthralling and slightly unnerving music was enough to give even Mike Oldfield goosebumps.´ Barry Gordon. Evening News. Charity concert for Tibet. Performance with Philip Glass, Ashley MacIsaac, Marisa Monte, Patti Smith Group, Ray Davies in THE CARNEGIE HALL, New York City. February. 2005: Phamie performed a collaboration with Galician piper, Carlos Núñez. She also recorded her composition ¨Kepa Junkera in a Basque carnival¨ with Kepa Junkera himself in the Basque country, Spain. 2004: Phamie was chosen to perform in Edinburgh`s Usher Hall for the Dalai Lama, and an audience of 1500 people. 2003: As part of winning the `Best newcomer award 2003` Phamie was invited to perform in Broadway, New York in amongst folk legends such as Pete Seeger, Karen Matheson, Phil Cunningham, and many more. 2002: Phamie represented Scotland in the International Celtic Music Festival, Interceltique, in Lorient, France, and later musically directed the play Le Roi Cerf, performed by Le Petit Pied theatre. Plus, stuns Italy with her performances with her new band. 2001: Phamie won an International harp composition competition in Dinan, France, where she performed a solo performance, and gave some workshops. 2000: Premier of Lammermuir with Alasdair Fraser, Eric Rigler, and others, in Celtic Connections festival, Glasgow Scotland. Phamie also performed solo on the same stage as Seamus Heaney in the main auditorium in Glasgow`s Royal concert Hall (2500 people). 1999: The first winner of the `Danny Award` as part of Celtic Connections International music festival, Scotland. Given a New Voices commission to write an hour of music (results being Lammermuir).